QCBD’s software suite is an affordable and fully integrated Quality Management Software for managing all your quality system data. 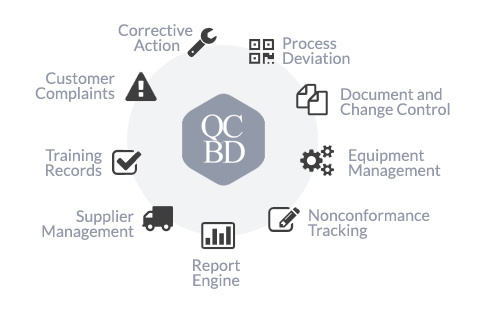 Designed specifically for manufacturing companies, QCBD dramatically reduces the cost of achieving and maintaining compliance to quality management standards. QCBD is a Windows-based client server application (not a web application) and is designed to be scalable, growing with your business. Start small and add modules and upgrade when you need it. QCBD has the lowest total cost of ownership of any Quality Management Software (QMS) available – guaranteed. Email Notifications – Automatically alert users with tasks and distribute data records and reports. Unlimited User Seats/Licenses – A single license supports your entire team. No individual user licenses necessary with QCBD. Electronic Signature – E-Signatures enable users to approve, route and store records online. Meets requirements for 21 CFR Part 11 (Electronic Records and Electronic Signature). User Permissions – User specific security, from read-only rights to full supervisor permission. Attachments – Upload and attach digital photos, scanned images and documents to make them part of the record. Ability to check out / check in attachments. Power Search – Find, sort, filter data to quickly find what you need. Customize – QCBD is highly configurable. Customize module screens and printouts to suit your organization’s terminology and descriptions. Connect Remotely – Access your data from any location.